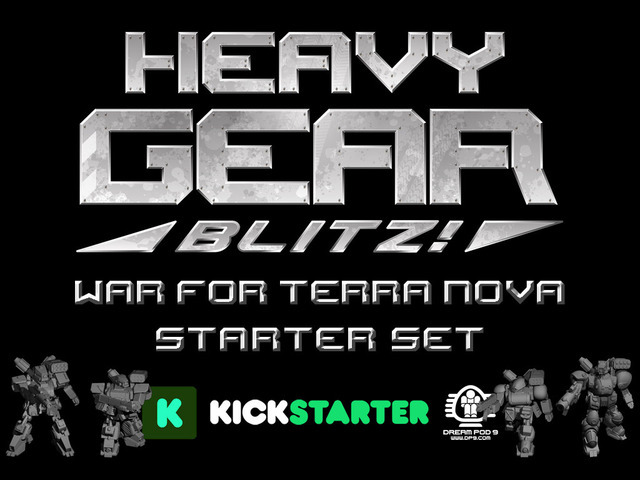 Dream Pod 9 got their Heavy Gear Blitz: War for Terra Nova Starter Set Kickstarter underway. They're already funded, so it's on to stretch goals and extras for 29 more days. 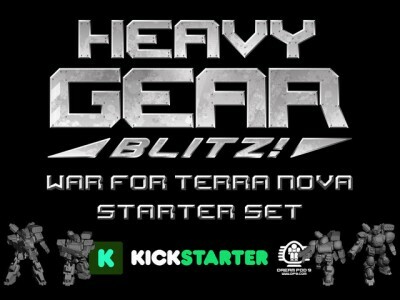 The Heavy Gear Blitz - War for Terra Nova - Starter Set Kickstarter is to fund molds for plastic miniatures. These high quality multi-part miniatures for our tabletop wargame will form the new two player Basic Starter Set of 16 miniatures - with 4 different models at the start. We don't want to stop there, a Core Starter Set is also available, with stretch goals that will unlock new models and add move plastic miniatures to the Core Starter Set. Our desired goal is a Core Starter Set of 46 miniatures and color quick start rulebook, which will be accomplished by reaching the 13th stretch goal of $105K CAD. This would allow for a variety of eighteen different models from 4 factions in a Core Starter Set for two players, with a multiplayer option of up to four players. We need your support to make it happen. We will also be adding some more pledge levels for Faction Army Sets once enough of the models for a faction are unlocked and a new retail pledge level once stretch goal 13 is reached. The staff at Dream Pod 9 thanks everyone for their support.